The Sonoma Stripe Fabric Shower Curtains have beautiful rose inspired vertical stripes that work well with many bathroom decors. 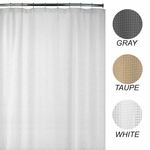 Available in standard shower curtain size, 70"L x 72" W.
Rose Sonoma Stripe Shower Curtains are one of our top selling value wholesale fabric shower curtains. The Rose Stripe Colors include: Yellow, Burgundy, Purple and Peach Stripes. This is an excellent choice if you're using beige, off-white or white bath towels and bath rugs. 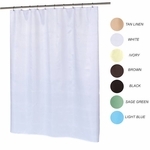 These 100% polyester, standard size fabric shower curtains are water repellent, machine washable and fade resistant.